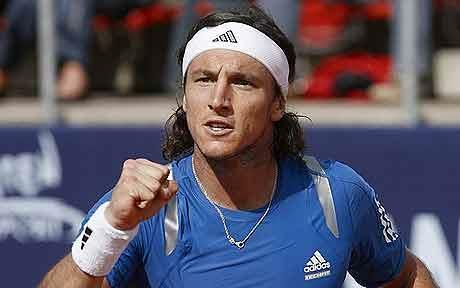 Argentina’s Juan Monaco clinched his fourth title of the year Sunday as he beat Julien Benneteau 7-5, 4-6, 6-3 to win the Malaysian Open and maintain his hopes of reaching the ATP World Tour Finals. The match lasted three hours and came a day after Monaco, the second seed and current world number 11, came through a tight semi-final against Japan’s Kei Nishikori. Monaco’s first ever hardcourt win, after six previous victories on clay, keeps alive his campaign to reach the Tour Finals in November as one of the eight top-ranked players. But it meant heartbreak once again for France’s Benneteau, 30, who appeared hampered by injury and has now lost seven ATP finals. “It was an excellent game and I will never forget the Malaysian Open as it has brought me my first hardcourt title,” said Monaco, 28. Benneteau started the match with his right forearm heavily taped, but he got off to the perfect start as he broke the Argentine’s first serve. Monaco broke back in the fourth and ninth games but Benneteau refused to give up and tied the first set 5-5. The 12th game was a thriller which lasted 20 minutes and saw 12 deuces before Monaco broke Benneteau’s serve to take the first set 7-5. Benneteau, who looked uncomfortable throughout the match, called the trainer for attention to his right leg. But he came out strongly in the second set, breaking Monaco twice to take it 6-4. However, it was Monaco who had the extra burst of energy in the third as he broke the Frenchman’s serve in the sixth game to clinch the set 6-3, and with it the title.